In this article, we'll show how to display data from your Freshdesk customer support software on your Geckoboard dashboard. Adding your Freshdesk data to a dashboard allows you and your team to keep an eye on live ticket volume, spot issues quickly, stay on track to hit your goals and, above all, deliver better service to your customers. Search for Freshdesk using the Search sources field. Alternatively, you can also scroll down the alphabetical list of integrations until you reach the Freshdesk integration. Click on the Freshdesk integration. Is this is your first Freshdesk widget? 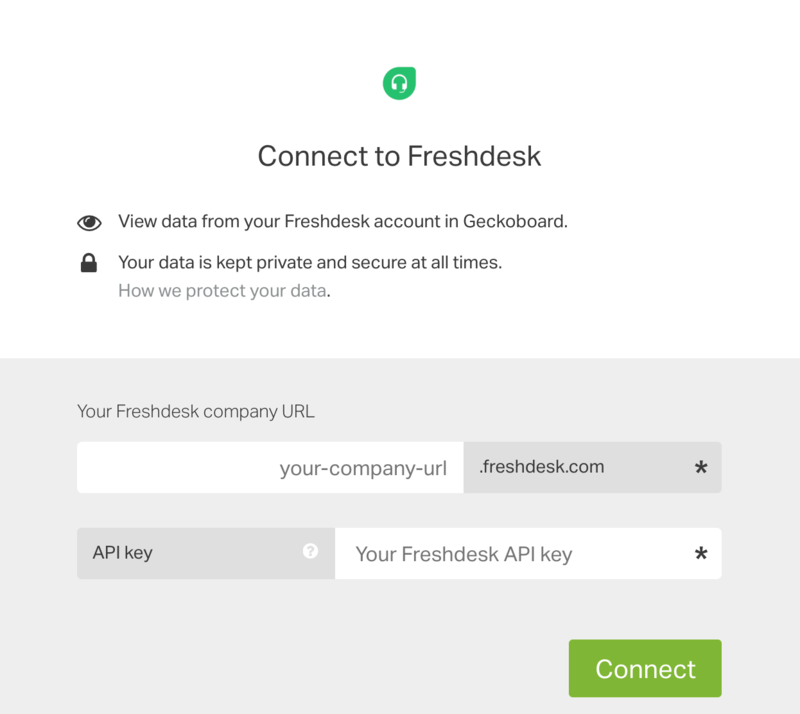 You'll need to connect your Freshdesk account to Geckoboard. If not, you can skip to configuring your Freshdesk widget. When adding your first Freshdesk widget, you'll be asked to create a connection and authenticate your Freshdesk account so that we're able to collect your data and display it on the dashboard. You only need to create this connection once – we'll take care of the rest. You must have Admin level credentials in Freshdesk to successfully authenticate. The authentication box will ask you to enter the subdomain and API key of your Freshdesk account account. The subdomain can be found from your login details. For example, if you log in to Freshdesk at https://mycompany.freshdesk.com, your subdomain is mycompany. With regards to the API key, this article explains how to find it. You're now ready to configure your first Freshdesk widget! You may need to create Freshdesk widgets using a different account to the one you used to create your first Freshdesk widget. If you want to create a dashboard for the support teams of both mycompany, who log into Freshdesk at https://mycompany.freshdesk.com, and yourcompany, who log into Freshdesk at https://yourcompany.freshdesk.com, you would need to connect separately to these subdomains within Geckoboard. Click the Freshdesk logo in the top right hand corner of the widget configuration menu. The widget configuration screen enables you to select the visualization you'd like to use, as well as choosing the metrics you want to show and adding any filters to the data. Your widget will update on your dashboard as you create it. This will use real data from your Freshdesk account. You can use the Past 7, 14, 28, 30, or 90 days option to track the previous 7, 14, 28, 30, or 90 full days, or the Today, This week, This month option to show the calendar day, week or month in progress. It is also possible to use a Custom timeframe up to the last 2880 hours, 120 days, 17 weeks or 3 months. We always count the week as beginning on a Monday in this Freshdesk integration. The maximum number of columns available is 3 and the maximum number of line chart series is 9. If more than this is available, you will not see all of the available data. You may need to Group your data by a particular value in order to create a chart or leaderboard so that we know which values to use for rows or labels or for the horizontal axis of a chart. For example, it's possible to see many of these metrics calculated for particular agents or tags as well as showing them by time. 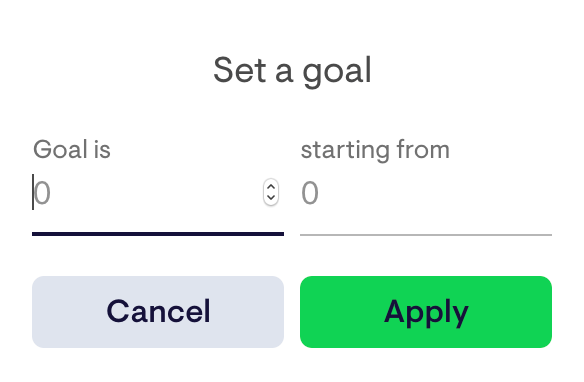 When adding filters, you'll be taken to a new menu and can choose a filter from the dropdown options and a value that you'd like this filter to match. 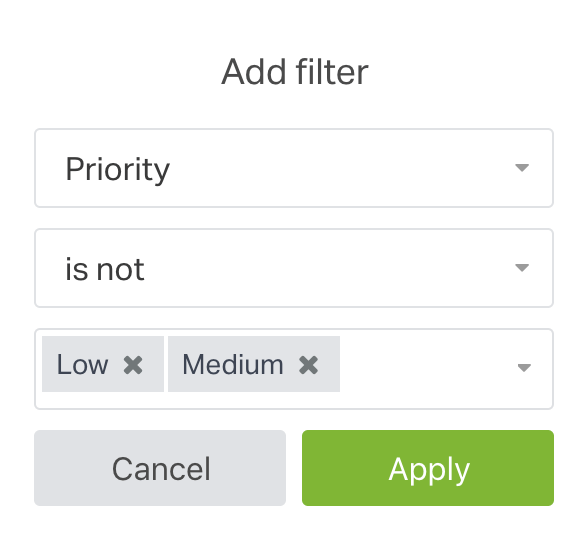 Most filters allow you to select that it is or is not a specific value or that the filtered option has any value or has no value. Time based filters, such as Created at allow you to select a timeframe of the Past 7, 14, 28, 30, or 90 days or Today, This week, or This month. It is possible to assign multiple values to the same filter but not to use the same filter more than once within the same widget. You could see the same data by filtering to show only those values that the data is or to show only those values that the data is not but you could not choose both of these options. 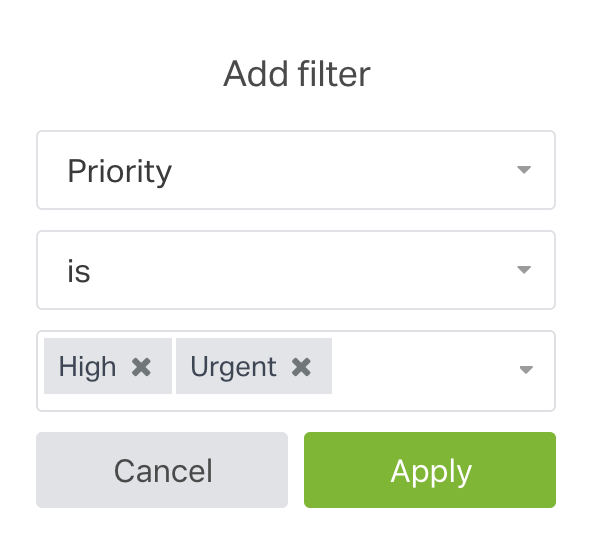 If you'd like to see only tickets with High and Urgent as their priority level, you could apply the filter Status is and the options High and Urgent, or you could apply the filter Status is not and the options Low and Medium.